Enhancing the quality of life for individuals with intellectual and developmental disabilities and their families in eastern North Carolina. 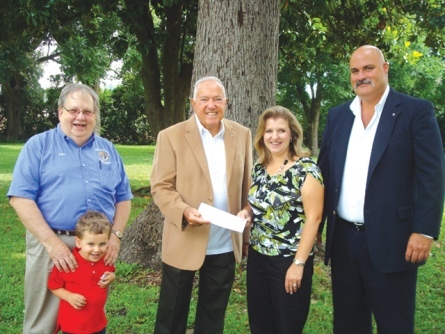 Danielle Howell, Caswell Center Foundation executive director, accepts a donation for the Caswell Developmental Center, from the Knights of Columbus. From left are John Gouldie, Knights of Columbus, with his grandson Dylan Dossary; Angelo Gibilaro, State Knight of Columbus treasurer; Howell; and Jim Laraia, Knights of Columbus. This community outreach program raises statewide funds each year that are given to schools, agencies and state facilities that provide care and services to people with intellectual and developmental disabilities. Caswell Center Foundation recently was presented with a check in the amount of $10,942 to fund several projects at Caswell Developmental Center. Covering 38 Eastern North Carolina counties, Caswell Developmental Center provides specialized residential, programmatic and support services for adults with intellectual and developmental disabilities in an environment that fosters independence and self-determination.